Going on a walk is not only good exercise, it’s also a lot of fun. And, it’s a easy and simple family fun idea. In case you want to add a little variety to your neighborhood walk, here are 10 fun walk ideas for families. So, let’s get outside, get moving, and have some fun with our family. 1. Go on a counting walk. Count the number of trees you see or count the parked cars. 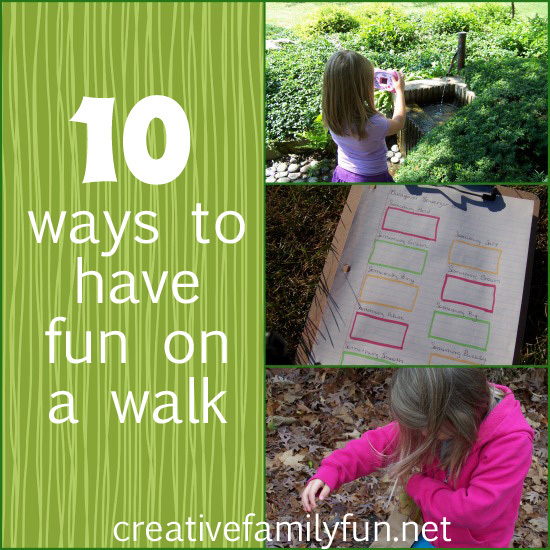 Come up with a few things you see routinely on your walks and have the kids count them. 2. Take binoculars and look at your neighborhood up close! 3. Make it a scavenger hunt. 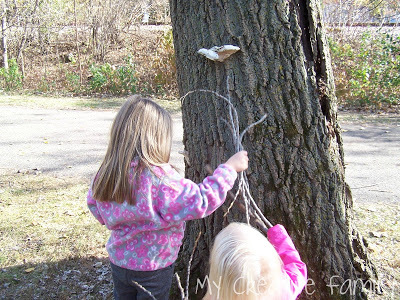 Look for something big, something tiny, something rough or something smooth like we did in our backyard scavenger hunt. 4. Play “I Spy” while you walk along. “I spy something brown and green and taller than a house.” Whoever guesses first gets to come up with the next clue. 5. Go on a color hunt. See how many different colors you can find. 6. Take your camera. Document all the things you see on your walk, then turn it into a book when you get home. 7. 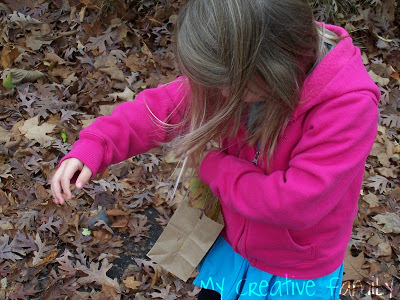 Bring a bag and look for nature treasures like we did when we went leaf collecting. 8. Go on a listening walk. How many different things do you hear on your walk. 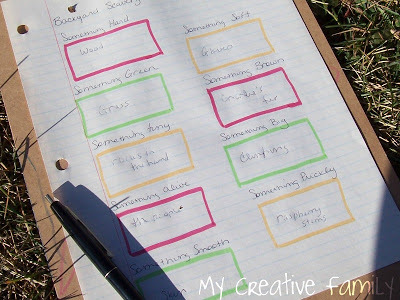 Here is a fun idea for a listening walk along with a printable checklist. 9. Stop and climb a tree. You can read about the benefits of climbing trees over at Childhood Beckons. If you don’t want to climb a tree, stop and examine a leaf, smell a flower, make a snow angel or jump in a puddle. In other words, enjoy and experience! 10. Find a new-to-you place to go for a hike. Your walk doesn’t have to be around the neighborhood! In case the idea of taking young children on a hike makes you nervous I have some simple tips to make it easy on everyone. Check out this article on finding the balance between outdoor safety and adventure from Teach Preschool. So, why not climb a hill and run back down it! 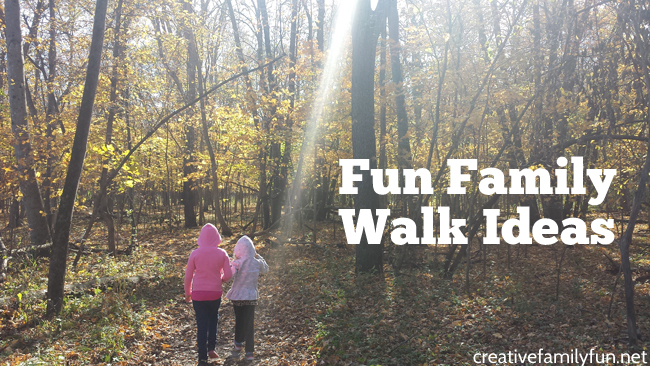 What is your favorite fun walk ideas for families? 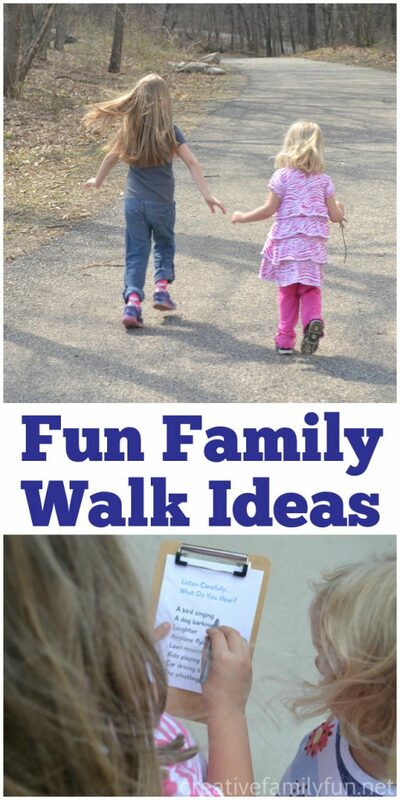 If you enjoyed these fun walk ideas for families, the above photo is perfect for sharing on Facebook or you can save the photo below on Pinterest. Where we live we like going on nature walks. Counting trees would be a bit much, but the binoculars is a great idea. There is a park near us where we walk and a scavenger hunt is most definitely going to be in the mix next time. Thanks!